This badge was issued to Vy Tran on 02 Feb 2019. 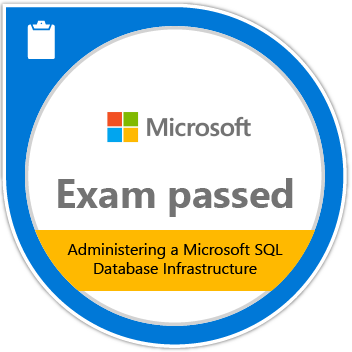 Passing Exam 764: Administering a Microsoft SQL Database Infrastructure validates a candidate’s skills to perform installation, maintenance, and configuration tasks. Other demonstrated skills include setting up database systems, making sure those systems operate efficiently, and regularly storing, backing up, and securing data from unauthorized access.